South Africa is home to eight different racetracks – Kenilworth and Durbanville in the Western Cape, Turffontein and the Vaal in Gauteng, Greyville and Scottsville – which are based in KwaZulu-Natal, the Northern Cape racetrack of Flamingo Park, and Fairview in the Eastern Cape. 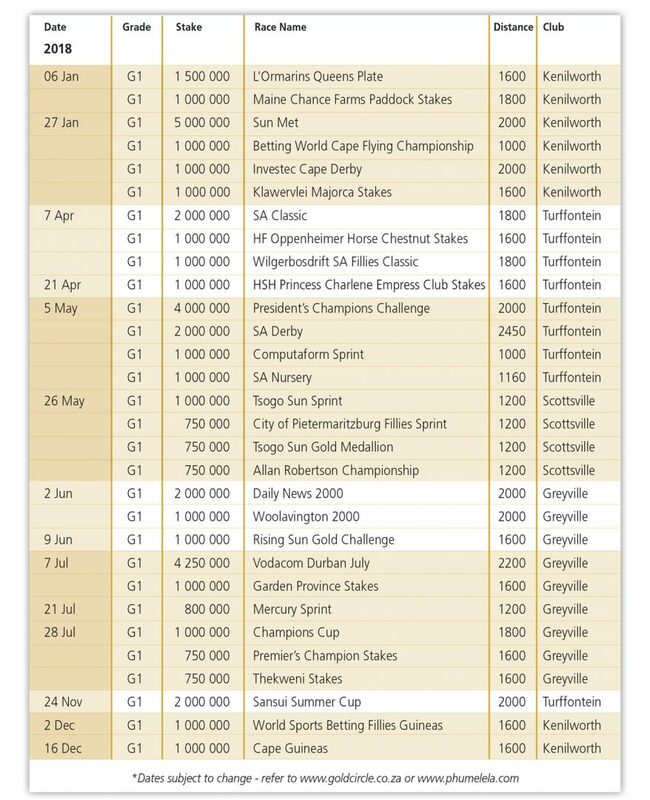 Gauteng, KwaZulu-Natal and the Western Cape are the main racing centers and all South Africa’s Grade One races are held in these three centers, focused on turf tracks. Greyville, which hosts a number of meetings at night, and Fairview, also sport polytrack courses, with the polytrack having first been introduced to Durban in 2014. The Vaal, Flamingo Park and Fairview tracks also offer sand racing.